I’ve been thinking a lot about the place of art quilting within the larger fine art and fine craft worlds. Some really good points were brought up in comments June, Jaret and others made in response to other posts. I see myself as an artist who happens to work in the medium of quilt as a means of expression. I see baggage attached to the label of the medium and I also see potential in and beyond this label. Using the word “quilt” raises an expectation in the viewer and I feel it holds a perceived limitation. “Quilt” carries with it an implied function – bedcovering, blanket, etc. “Quilt” also carries an implication of form – three layers, two dimensional, textural surface, double sided. As part of a previous discussion about the choice of “quilt” as medium, we asked what can “quilt” do that other media can’t? Are we exploiting that enough? If we do exploit it, are we challenging the viewer’s expectations? In another medium, there are artists working in embroidery, for example, who have so broken away from the perceived limitations of their medium that it is nearly unrecognizeable. Janet Edmonds immediately comes to mind. I would love examples of artists pushing quilt this far. How do artists in other media break away from the perceived limitations of both the form and function of their media? Is it necessary to break away to be taken seriously as artists? If as an artist your chosen medium is ceramics do you need to stay away from vessels or teapot forms to be taken seriously? Is there a way to embrace a stereotypical form in your medium of choice while challenging your viewer? If you keep the form but negate the function (and vice versa) is this enough? Are we doing this as artists working in quilt? I don’t think that artists working in the traditional fine art media of oils, metal, acrylic, watercolor etc have the same factors to take into consideration. While an oil painter may chose to create work outside the structure of canvas stretched on wood, the form and the function of an oil painting isn’t ever going to be an issue for him/her. Quilt works for me. Although there are definately misconceptions at times about what I am making (until the person sees it of course), the word quilt has helped me start conversations with people about my art. Recently it’s paid off big time when I was talking to a curator, when I mentioned I made art quilts, she got interested in seeing the work, and eventually invited me to be part of an exhibit (not quilt) this summer. Perhaps we won’t have to wait a few centuries to be accepted into the art world, till the time textiles just are a normal part of it all. Collage, photography (and digital photography), video are viewed in exhibits and taken as classes in art school without a second thought about it. My daughter is in high school and is setting her course for an art degree after that, so i try to pay attention to what universities are offering now (and boy is she getting deluged with college brochures, even as a sophomore). 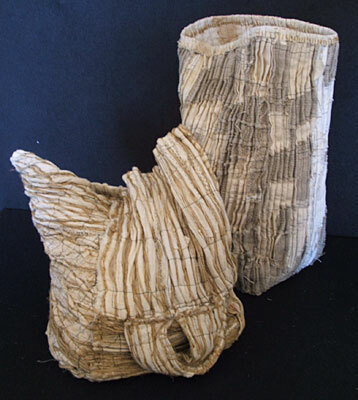 Seeing that more colleges offer textile study in their art department is great; there is a decent-sized list of MFA Fiber Art Programs on the SAQA website. I hope we are the last generation to have to struggle with this. 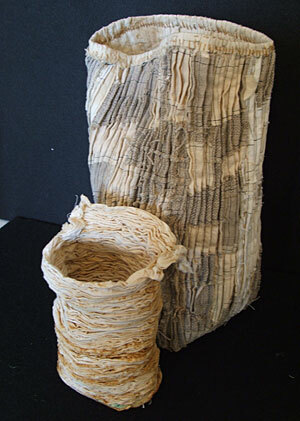 We will see more textile artists with art school training and a smaller percentage with weekend workshop training. And no doubt they’ll take it to the next level and create forms which we never dreamed of. Technology gives us new art forms but the art still has to be about an idea. I have progressed enough that I have to ask myself, why am i making this in cloth instead of just painting it – what can i do with this cloth that a painter can’t do with the canvas? What story do i want to tell the viewer? I’m still working on it with each new piece and i’m not there yet. But i *am* working on it! I see you refusing to answer the questions you pose. Now, now, is this fair? Take a stand — all that can happen is a good interesting discussion can develop. For example, I am interested in how the quilt world, the DIY-ers (do it yourself crafters) and art worlds intersect. I think that for many art quilters, the quilt is first, the art is second (adjective –art –noun –quilt!). They are basically DIYers who are not interested in theory and practice within the fine arts although they do delight in creativity and play out of which art can sometimes take form. It makes sense to me that there would be far more of those DIY folks out there than there are committed artists — isn’t it true that there are more people who have woodworking shops than are actually turning out wood sculptures? My problem is not with the wannabees and the creative players — they feed the teachers who then can pay the rent and make art, they make exhibits popular (if not monetarily worthwhile) so there are places for the artists to put their work, in short they hold us up with their time and attention and work; they form a foundation for us. But I really think that we as artists allow ourselves to be seduced, if you will, by the tidy structures that the quilt world brings. If our points match, our bindings are full, and we have a good range of values, haven’t we made art? Well, no. Those are irrelevancies. Art comes from elsewhere and just because we use stitching to make it doesn’t mean that anything about the stitching is going to propel us into art making. I think the artists working in stitched textiles tend to be a bit smug about their adherence to or breaking away from the conventional standards of quiltmaking. I think that such adherence to or breaking away is totally irrelevant — we should not allow a field so far away from our own goals and aspirations to become something we measure ourselves by. I find the “quilt” part of quilt art to be irrelevant to what I do. I stitch fabrics together and that allows me into exhibits such as Quilt National. But other than the techniques, I have little in common with traditional quilters and not much more in common with the DIY-ers. I am elsewhere (here on Ragged Cloth, for example). You cannot be yourself as an artist until you stop thinking of yourself as a quilter. Not that you are for or against quilting or the community of art quilters (which can be quite endearing, in fact) but that you are something totally other. And to keep pushing against the quilting community means that you are still tethered to it. So there — I answered the question and now the pummelling can begin. I think Eileen is onto something which she talks about the meaning of form — it isn’t something we hear much discussed in our circles, and maybe we should correct that. Here’s a heretical statement: If you choose to work the form, as some very good artists do, of, say, the pieced quilt, then that working has to be grounded in some vision, some meaning, some particular voice that you can consistently produce and articulate. The ground can’t be “the pieced quilt.” It might be the geometries of contradiction or seams as lines as articulated skeletons — something within the realm of imagination and meaning and vision. And I don’t think it’s enough to make imagery that negates the conventional ideas about the quilt — that may have been enough 20 years ago, but it’s long passed its prime as a useful tool of art. So, Maggie, it’s Thursday evening, I’m still hacking and coughing, and I need something to take the damp out of my bones. A good rant will always warm me up…. Interesting choice of example, the teapot. The first thing I think of is Mary Beth Bellah’s quilted teapots (sorry, couldn’t find an online image). Go to guild.com and search on teapots, you’ll get nearly 100 hits for artists’ new take on this time-honored and homely (in the original sense of the word) form. Forms with essentially universal recognition invite artists to make them over in a new image. So it is with bed quilts turning into art quilts. I pretty much shrug when I hear the argument come up about the word “quilt” and should we use it. Don’t want to go there anymore. In the long view of things, historically there was only one form of art, and that was sculpture. Painters were second class, and there wasn’t any third class. It probably wasn’t till the last millenium that that changed. However, I’m not willing to wait another millenium till we have our turn.